LAS VEGAS (CN) – A city once held in disdain by the National Football League will soon host one of the league’s most storied teams, after team owners on Monday voted 31-1 to allow the Oakland Raiders to move to Las Vegas. Las Vegas will eventually welcome the Raiders with a proposed $1.4 billion, 65,000-seat stadium and $750 million in public funding. NFL owners met in Phoenix today to vote on the proposal, which only the Miami Dolphins opposed. He said 18 owners on the stadium and finance committee worked on the relocation proposal, and worked with Oakland for more than a decade to “provide a viable option” to keep the Raiders in the Bay Area. “We just couldn’t get that done,” Goodell said. Raiders owner Mark Davis said, “The greatness of the Raiders is the future,” adding it was a difficult decision to move from Oakland. He told Raiders fans the decision was his alone. The Raiders played 45 of 58 seasons in Oakland, and will play there at least one more season. Davis said he intends for the Raiders to play two to three more seasons in Oakland before moving to Las Vegas. Goodell said there were too many uncertainties in Oakland, including whether or not Major League Baseball’s Oakland A’s would continue playing in the city, and whether a new stadium could be financed and built. In Oakland, Raiders fans were incredulous that the team – born in the city in 1960 – would be moving again. Some exploded with invective on Twitter, threatening to burn their Raiders gear, while others trashed Las Vegas as the team’s new home. Other fans were more sober. “As a lifelong avid fan of the Oakland Raiders, I cannot express the amount of heartbreak, sickness and betrayal that I’m feeling,” Ryan Cooper of Alameda tweeted shortly after news of the move broke. 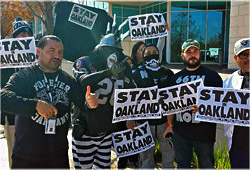 “Sad to lose the Raiders, but happy Oakland refused to give public funds to NFL owners. These billionaires don’t care about fans, only $$$,” another fan Liam O’Donoghue tweeted. Though Oakland Mayor Libby Schaff negotiated strenuously to keep the Raiders in town, she repeatedly said she wouldn’t break open the city’s coffers to do it. Under a negotiating agreement with NFL Hall-of-Famer Ronnie Lott and Fortress Investment to build the Raiders a new $1.3 billion stadium in Oakland, the city only offered to pay $200 million in infrastructure improvements. That money would have come from private bonds secured by taxes generated by the stadium, and not from the city’s general fund. In a letter Schaff wrote to individual NFL team owners and hand-delivered to them before Monday’s vote, she subtly accused the league of elevating profits over the game. Schaff reiterated her claim in a statement Monday afternoon. In Las Vegas, public funding through an approximately $1-per-day increase in hotel room taxes will pay for a $750 million bond to be put toward stadium funding. Davis previously pledged some $500 million, and Las Vegas Sands chairman Sheldon Adelson another $150 million toward building the stadium – an offer Adelson has since rescinded. The 65,000-seat stadium will have a retractable roof, and will host the Raiders and likely the University of Nevada-Las Vegas football teams. The approved move to Las Vegas reverses the NFL’s prior stance of avoiding Las Vegas, with its gambling industry and past ties to organized crime. It also comes a year after the National Hockey League approved an expansion franchise that will start play next year at Las Vegas’ T-Mobile Arena. The National Basketball Association holds its annual summer league in Las Vegas, and several Major League Baseball teams play spring-training games in the city.